In late March Jeanneau debuted their latest models on brand event in Cannes – new shining Prestige models, the new Sun Odyssey 51 and several nimble and quick Merry Fisher models, and the Leaders range. Although smaller in size than anything we usually test, Leader 30 and Leader 33 caught our eye. The Leader series enjoys huge popularity in Croatia, where clients appreciate the sport yacht – family boat mix. In Cannes our host was Merry De La Paz (who lend his name to the Merry Fisher series), who presented his brainchild, the Leader series, better than anyone else could. Jeanneau brought the entire Leader series to Cannes – all the models except 36 – so comparison was inevitable. First boat for many owners, Jeanneau Leaders are yachts that grow with their owners (who often graduate to models of the Prestige series), sort of entry level yachts that attracts new owners and ties them to the yard. One thing in common to all models of the Leader series is the designer: they are all created by designers of Italian studio Garroni, who sign all their yachts with the recognizable Black Corner – the little corner where the glass surfaces of the windshield meet on all models of the Leader, NC, Merry Fisher and Prestige series. That little design move is just one of the many that make new Leaders seem familiar. We’ve selected to test two smaller models; the 30 and the 33. Both small and rather similar in almost all features, those two are ideal first boats. The list of features they share is long cockpit (but what we liked best on both of them): generous in size and very functional (the aft bench is foldable, and the table can be lowered into the sunpad, which turns the cockpit into a rather large sundeck). Leader models usually beloved for their exterior, and these two new ones don’t disappoint in that regard, either. Their cockpits also hide several large storage units, largest of whom lies under the central part of the cockpit that is also accessed through the transom. Both models have a small galley in the cockpit (starboard) and an adaptable co-skipper’s seat port, as well as a large window in the front port part of the cockpit. Glass surfaces on both models are large and well spaced, which is a feature the Leader series shares with the Prestige models. Below deck there are two cabins. 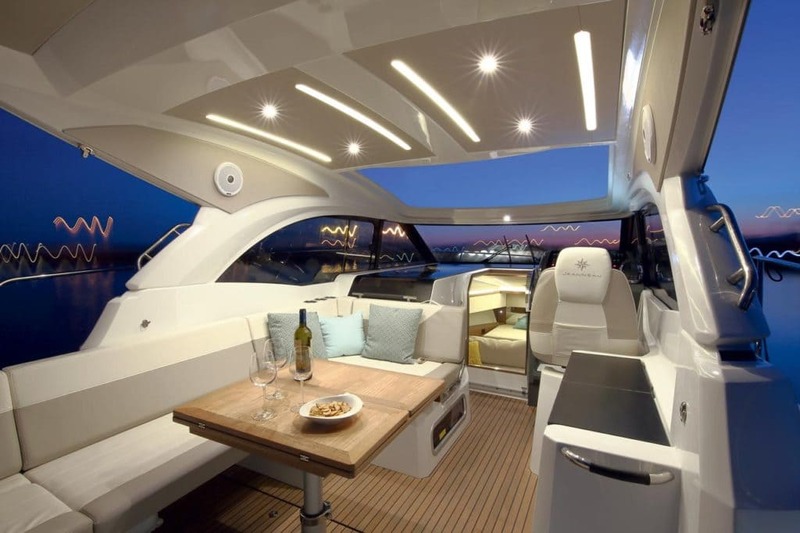 The bow one on the 33 can be hidden behind a partition and has a day bed that turns into sofa, while the bow cabin on the 30 has a U-shaped sofa that doubles as a bed through lowering a table. On both models the galley is on port and the heads on starboard, while the aft cabin stretches across the width of the hull – the designers were obviously inspired by Jeanneau sailboats regarding the decor. Light and spacious interior makes both new Leaders pleasant enough for short cruises, and are as comfortable as a unit barely ten meters in length can be. Their exterior, though, is downright delightful – other than the large cockpit, both models have bows that double as sunbeds (complete with a small teak ladder in front). One of the few significant differences between the two models is the cockpit roof – on the 30 it is merely a soft bimini, while the 33 has a sport top. We tested Jeanneau Leader 30 and Leader 33 on calm seas and were satisfied with what they’ve shown. The 30 is powered by a single engine, while the 33 has two, thus the difference in their cruising ability was expected. Leader 30 (powered by a Volvo Penta D4 300) reaches top speed of 29.5 knots and has cruising speed of 21 knots at 3.000 rpm (30 liters of fuel per hour), while the 33 (powered by two Volvo Penta D3) reaches top speed of 31 knots and has cruising speed of 27 knots. 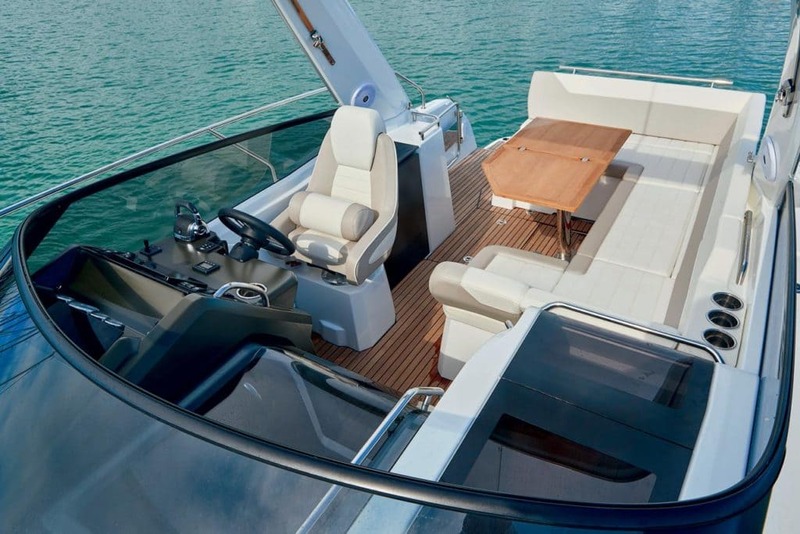 Jeanneau Leader 30 can also be powered by two Mercruiser engines and reach top speed of 37.5 knots. One thing we have noticed – both yachts will only reach their top speed on very calm seas, as they are rather limited in speeding by their size. Rather than testing larger new models, we’ve chosen to see if these two new smaller ones are as good as their larger sisters. Laced with the same DNA that makes larger Jeanneau models so attractive, Leader 33 and Leader 30 proofed to be impressive for their size and type, well designed and with several delightful practical solutions.